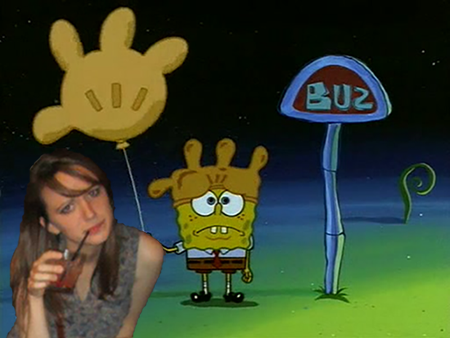 just me n spongebob in rock bottom etc. I'm introducing a new series to Just PMSing called "The moment I knew I hit rock bottom." This will be good because 1) it will give y'all a chance to laugh at me and my life and 2) it will force me to write hopefully once a week and make me remember how sad my life is. Are y'all excited?? I am. Truth be told I told a co-worker what I had for lunch and he said, "When did you know you hit rock bottom" and I said oh. I went to CVS to pick up my anti-depressants prescription and also bought off-brand Lunchables -- the pizza kind with pepperoni-- and ate that for lunch. And then the next day I found out I picked up the wrong antidepressants and the right ones wouldn't be available until the next day. But also for lunch one day, I ate KFC but I ate the disgusting KFC bowl -- you know the bowl with the mashed potatoes, gravy, corn, cheese, and chicken all mixed together. It's one step away from having someone chew your meal and spit it in your mouth. I showed up to my grandmother's 99th birthday lunch a lil hungover. I cried during an episode of Keeping Up With The Kardashians. I asked my dad what his email was and after he gave it to me, he said, "That's where I send all my junk email." I lost the Apple TV remote and looked in my roommate's dog's poop to see if he ate it. Almost got punched in the face. I bought jeans from Walmart. Can't wait to share all my RB moments with y'all. Like me on FB and then like me in real life also.